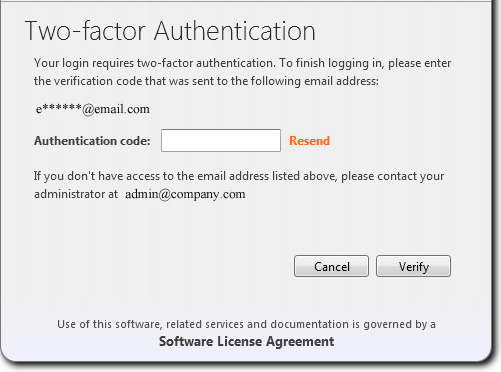 Administrators may enable two-factor authentication for a user login. If enabled, users receive a text message (SMS) or email containing an authentication code when attempting to login. In addition to password, users must provide this code when logging into X_TRADER®, X_RISK®, or TT User Setup. Users must ensure that the administrator populates the correct SMS number or email address in TT User Setup prior to enabling two-factor authentication. Warning: Users cannot login if they cannot access the email account listed by the administrator in TT User Setup. Also, if their SMS number is incorrect they will not be able to log in. Once enabled, TT User Setup automatically sends or emails the user’s authentication code when the user first attempts to login. The first time a user attempts to login after two-factor authentication is enabled, TT User Setup automatically sends an authentication code to the user’s SMS number or email address. The user must populate this value into the login dialog to continue. For both SMS and email, the user may request a new code by pressing the Resend button.